No matter how impossible the situation may seem, God can do amazing things when we invite Him into the needs of our family. Although the needs change with the various seasons of a family’s life, the most critical prayer we can pray is for the salvation of a lost loved one. As we pray, we should remember that God “wants all people to be saved and to come to the knowledge of the truth,” and our desire to see our loved ones saved cannot compare to His (1 Timothy 2:4). We must remember that we are not praying to an unwilling God, but a God who stands ready to save and redeem. This month we will unite our prayers to pray for our lost loved ones, asking the Father to give us opportunities to share the Gospel with them, and praying for Him to soften the hearts of our family members. There is great power when two or more gather in Christ’s name and pray for His will to be done (Matthew 18:20). As we pray for our loved ones, God will ready our hearts to do His will and give us the assurance that He can change hearts. 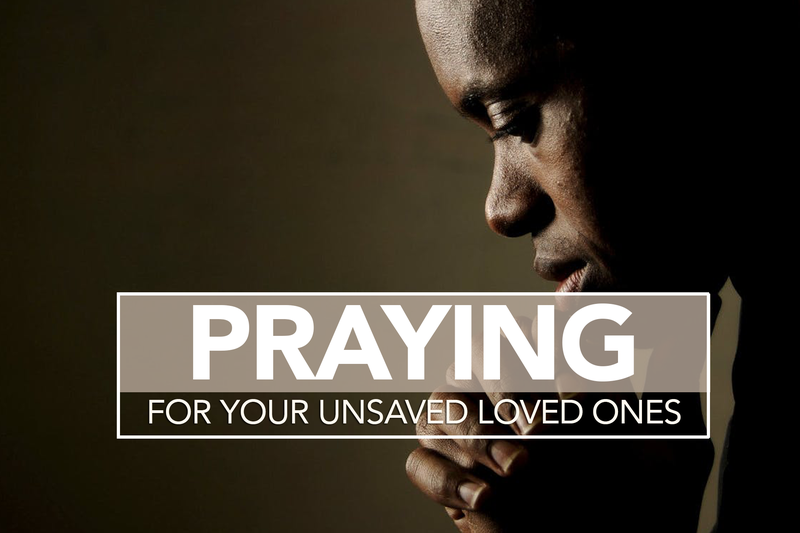 We must not give up praying for our unsaved family members. We are engaged in a spiritual battle (Ephesians 6:12–20), and one of our greatest weapons is prayer. God can do the impossible, and He can change even the hardest of hearts. Give praise to God the Father and to Jesus Christ who is Savior and Redeemer who came to seek and to save the lost (Luke 15:1–31; 19:9, 10; John 14:6). Give thanks to God for the Gospel of Christ which is the power of God unto salvation for all who believe (Romans 1:16). Recount your testimony of salvation, thanking God for His salvation and deliverance (Psalm 40:1–3). Call out the names of your lost loved ones, asking for the Holy Spirit to draw them and help them understand their need for the Savior (Jeremiah 24:7, Romans 3:23; Romans 6:23). Pray for their eyes to be opened to the truth of God’s love and salvation (Acts 26:18; 2 Corinthians 3:16, Ephesians 3:18, 19). Pray with repentance of your own sin and the sins of generations before you that may have influenced your loved ones in their choices (Daniel 9:20). Name any oppression or addiction present in the lives of your loved ones and intercede that they be set free (Isaiah 58:6). Pray for an opportunity and boldness of the Spirit to share the life-changing Gospel (Acts 4:31). Pray that nothing would distract or hinder the moments of confession, repentance, and salvation of your loved ones (Ephesians 1:18–21; 2 Timothy 2:24–26). Praise God for the assurance that it is God’s desire to save your loved ones (Luke 19:10; Romans 10:1; 1 Timothy 2:4). Download this prayer guide here. Let us know you are praying with us by using #COGOPprays on social media to share your requests, inspirations, and praise reports.